Best Season: March-May, Sept. – Dec. If you have short time and still want to have mountain experience than Everest View Trekking is one for you. This one is one of the shortest trek routes in the Everest region. It is earthly is heaven for trekkers, climbers and mountain lovers in general. This trekking route as the home the highest peaks in the world offers the beauty of Himalaya and Sherpa culture combined with some of the rarest red panda, snow leopard, wild boar as well as Himalayan birds in Sagarmatha National Park. The trekker can have the view of the Mt Everest 8,848 m/ 29028 ft) along with four other peaks (included in top ten highest on the earth): Lhotse (8501m/ 27.765ft), and Cho Oyu (8,201m/ 26,906ft) and nearby fifth Makalu (8,463m/ 27,765ft) from the closest distance ever. Arrive in Kathmandu International Airport. Welcome by our representatives and transfer our Hotel. Fly to Lukla 2800 m. for half an hour in the morning viewing great mountains. Lukla is the small town to start the trek. Trek to Phakding 2652 m. which will take approximately 2 hrs. trek to Namche Bazaar 3440m. This day is longer than the first day. Approximately it will take 5 hrs and the last part is steep up of one good hour and from the uphill, you can view the Everest for the first time. 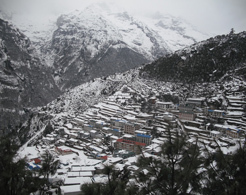 The weekend market with the local goods and Tibetan goods as well is the best attractions of Namche. Trek Namche Bazaar to Tyangboche 3867 m. The first part is flat and down to the river and then climb up to the Tyangboche. Tyangboche Monastery is very popular among the Everest climber where they get the bless from by the Head Monk of the Monastery for good luck and good wish. Rest day in Tyangboche to enjoy the monastery and the view of the great mountains. Trek back to Monju passing Namche Bazaar. Fly Back to Kathmandu. Overnight stay in the Hotel. * Three-star hotel in Kathmandu with breakfast. * All your standard Meals (breakfast, lunch, and dinner) during the trek. * Government licensed English speaking Guide and Porters to carry your luggage during the trek (1 porter Between 2 Person basis), their food, accommodation, salary, insurance, types of equipment, medicine. * Round Trip flight fare KTM –Lukla– KTM & domestic airport taxes in Kathmandu and Lukla. * Personal expenses such as alcoholic drinks, cold drinks, and mineral water etc. * All expenses which are not mentioned in price include section.